Four well-known activists, Rohit Prajapati, Trupti Shah, Amrish Brahmbhatt, and Kannagi Brahmbhatt, in a strongly-worded statement have described the proposed Statue of Unity in the memory of Sardar Patel as "Statue of Disunity", whose main aim is to "remove people from their land, forest and livelihood". Envisaged by the Gujarat government as the tallest statue of the world in the memory of Sardar Patel three kilometres downstream of the Narmada dam on Sadhu Bet, the activists have said also termed it as the Statue for Tourism Industries, Statue for Narendra Modi’s Name and Fame and Statue for Criminal Waste of Public Money. Belonging to the Radical Socialist group, the activists have said, "The estimated cost of the project is Rs 2,500 crore. The Government of Gujarat website calls it a 'monument, that will not just be a mute memorial like the rest, but a fully functional, purpose-serving tribute that will boost tourism and facilitate development in the surrounding tribal areas'.” Not without reason, they added, the “development” as envisaged around the proposed is "through the Kevadia Area Development Authority (KADA) mainly for tourism. Already, 16 villages have been brought under KADA, while the plan is to take the number to 70." The statement comes about a week ahead of Modi's scheduled iron rally at Kevadia Colony for collecting iron from farmers across India as a "donation" to build the statue. Pointing the statue is being promoted, the activists say, "A letter written by the Chief Executive Officer, KADA threatened the sarpanches of 52 villages adjoining the Narmada Dam that they better agree to hand over their villages for tourism purpose or else they would face consequences." Calling the behaviour of the 52 village Panchayat “improper”, the KADA letter says, “You are requested to send your approval for the use of your villages for developmental purpose within seven days. In case you fail to do it, then – keeping that in view – we will be forced to take further steps against you.” KADA comes directly under the Gujarat Urban Development Department and has been given the task of “developing” the area around the Narmada Dam into a tourism spot, with all types of entertainment facilities, hotels and sports. The statement says, "The six villages, which were the first to hand over the land way back in 1961-63 to build the Staff Colony, Government Offices and Guest House to build the Sardar Sarovar Dam, have even decades later not been considered equal to other project affected persons (PAPs), thus remaining deprived of all the facilities which other PAPs of Sardar Sarovar Dam of Gujarat, Maharashtra and Madhya Pradesh have been promised." 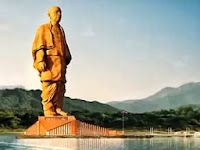 Appealing "progressive people and people’s organisations of Gujarat" to oppose the construction of Statue of Unity, the statement adds, "In fact, they cannot even access Narmada water for irrigation. Worse, the view is gaining ground among them that water is only for urban and industrial use. Instead of resolving the decade pending problems of the tribal, Modi is planning to spend Rs 2,500 corer over the statue for his electoral propaganda."